The Renton Farmers Market is committed to providing fresh, healthy, local foods for everyone. The Food Access program is a win-win for the Renton Farmers Market. 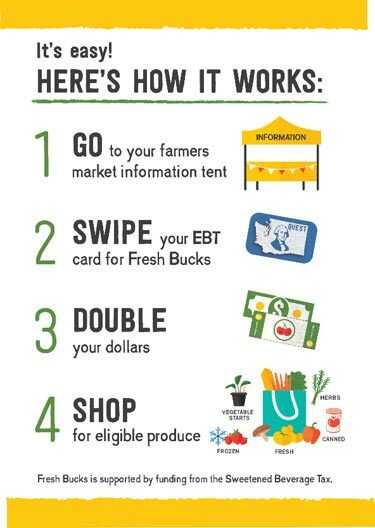 Those in our community who rely on EBT/SNAP/WIC can now purchase fresh, healthy, local foods and farmers can expect to see additional sales..
You can use your Electronic Benefits Transfer (EBT) card to buy local, healthy foods at Renton Farmers Market! Here is how it works: at the market manager booth, market staff will swipe your EBT card for the amount you request. You will be given Supplemental Nutrition Assistance Program (SNAP) wooden market tokens in $1 increments to buy fresh foods (anything except cut flowers, alcohol, and food/drink that is intended to be consumed on site). 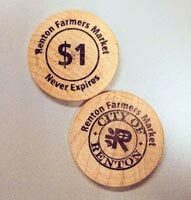 The tokens never expire, and are good only at the Renton Farmers Market. Vendors cannot give change back on tokens, so consider bringing some extra coin change with you to make your purchases. For information on applying for EBT benefits call 1.877.501.2233 or visit the website. Go to the market manager booth. Swipe your EBT card and redeem your desired amount of SNAP dollars in wooden market tokens. Double your EBT dollars now with no limit! Shop from any eligible vendor using your SNAP tokens and Fresh Bucks. The Fresh Bucks 1) Can only be used to purchase fresh produce such as: fruits, vegetables, mushrooms, herbs, and vegetable starts 2) Can be used at any of the farmers markets that accept Fresh Bucks and 3) Expire at the end of the 2018 Farmers Market season (expiration listed on the Fresh Buck). 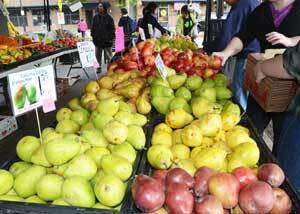 The Renton Farmers Market also participates in the Farmers Market Nutrition Program (FMNP). This program offers checks to those in the Women’s, Infant’s and Children’s (WIC) program as well as the Senior FMNP program. FMNP checks are specifically for purchasing fresh fruits and vegetables at farmers markets. WIC checks are distributed by WIC staff at the Renton Farmers Market, while Senior FMNP vouchers are mailed to applicants selected in the lottery. Look for farm booths displaying this sign at the market to use your WIC or Senior FMNP checks. 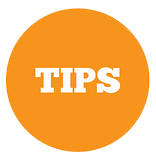 Vendors cannot give cash change - you must spend the entire amount of the check, so consider bringing some extra coin change with you to make your purchases. For more information about WIC FMNP, please call 1-800-841-1410 or visit the website. For more information about the Senior FMNP, please call Senior Information and Services at 206-448-3110 or visit the website. Applications are available each spring (mid-April) from the Seattle/King County Office of Aging and Disability Services, and may also be available at the Renton Senior Activity Center and generally due mid-May. Learn more about Food Access efforts by Farmers Markets across Washington State. Two-hour free parking is available at Renton's City Center Parking Garage -enter on 2nd Street.